Nitrate is a commonly occuring compound in many foods. It is also added during processing to increase the bacterial resistance and color preservation of many meats. High concentrations of nitrates can be damaging to sensitive individuals, especially small children, the elderly and livestock. The Nitrate Check rapidly detects low-level concentrations of Nitrates in food and drink. The safety of nitrate containing foods can be determined in minutes, giving sensitive individuals protection even when away from their own kitchen. 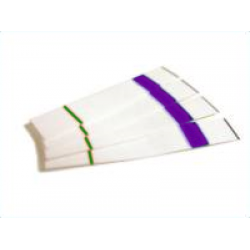 If the color formed on the test strip is darker than the color formed on the water strip, there are nitrites in the solution.